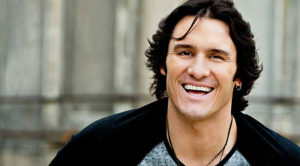 A multi-platinum recording artist, country singer Joe Nichols possesses a distinctive baritone that has helped him deliver six No. 1 hits and eight Top 10 singles over the course of a career that dates back nearly 20 years. His most recent album, Crickets, spawned the hits “Yeah” and “Sunny and 75.” Currently in the studio working on his next full-length project for RED BOW Records, Nichols just started a lengthy tour that he says will include about 85 to 100 shows. He phoned us from his Nashville home. What first drew you to music growing up in Arkansas? My dad. He played country music and I went to some of the places he played as a kid. I knew how much it meant to him because he seemed to always be playing music. I started listening so much that I could tell what I liked and didn’t like. I listened to what he liked. That kind of got passed down to me a little bit – the music of Marty Robbins and Merle Haggard and Noble Ray Price. I started to want doing music. I thought that if I had any talent whatsoever, I could just do what my dad does and do it for fun. I started singing in front of people and they liked it. Before you knew it, I was in a band. Things started to go that way. Was it always country or did you play rock music? You put out your first album in 1996. It didn’t sell and the label dropped you. How’d you rebound from that experience? It did okay enough to get me seen by some people. It gave me a chance to feel like I was able to do something with a label. When I moved to Nashville, I knew it wouldn’t be as simple as walking into a label and getting signed. I had a lot of maturing to do. For about five years, I had weird jobs. I delivered furniture. I unloaded trucks. I sold steaks door to door for one day. Meanwhile, I was trying to play every night and practice and sing every day and be better. I wanted to know myself. What do I want to sound like? What am I good at? Learning those things helped me get my deal on Giant, which was then sucked into Warner Bros. They wanted me to be more poppy at the time. They told me to explore my options to see what label would want to do a country record. I picked Universal South. I had matured enough to start the process and start making a record. [Session guitarist] Brent Rowan was huge for me. He let me mature. We went through hills and valleys together. A lot of things then happened in a very explosive way. The 2000s must have been great for you. You delivered a slew of singles during the time. It’s hard to explain. From the time to when I moved to Nashville and to the time I got the deal, there was a lot of growing. I stopped negative thinking and started being me. Going into the early 2000s, I had a No. 1 song, which was a big confidence booster. People were looking to me as a sign that country music was coming back their way. When “Brokenheartsville” came out, it was through the roof. We had a couple of more hits. The next album, Revelation, also did great. Throughout all this time, my mind was saying, “Hell, yes. This is great. This is amazing.” I think my maturity had stopped at 22 or 23. I had success come my way, and I still treated it if I was a teenager. I had too much fun. I was a little too pampered. It’s a blessing for me and I didn’t appreciate it enough. I had to reorient myself and be humble and start working hungry again. I have had to do that three or four times. You’d think I’d learn by now. That’s the key. When you’re humble and hungry you want to practice and make yourself better and find out what your connection with people is and what they like about you and what you want to play. If you figure those things out and do that on a daily basis, things work out. Talk about writing the material for Crickets. My deal with Show Dog-Universal was winding down and we mutually realized we were on two different paths. I started gathering songs myself. I couldn’t talk to labels in that situation, but I could write and do a lot of things. I found four songs and went into the studio the day after my contract expired with Show Dog. I cut “Billy Graham’s Bible” and “Y’ant To.” I went in with my own money and pitched them to a few labels and got a few offers. I decided to go with the label that had the biggest staff and the biggest number of radio slots. It was a good partnership. They loved the songs we cut and we cut more. We cut “Sunny and 75” and all of a sudden, we had 16 or 17 songs. It was a great process. I think we still have five or six singles on the record. “Hard to Be Cool” is such a funny song. What inspired it? [Song co-writer] Jason Sellers was also one of the writers on “Sunny and 75.” I think he picked it at the last minute. It’s fun and felt like a dry kind of song. It fits right in. Are those real crickets on the album? Yeah. Somebody went out and actually recorded them. I dig the horns on “Gotta Love It.” What inspired the decision to add horns to the mix? I wanted something with that feel to it. There are some country songs you wouldn’t believe had horns until you thought about them. Certain songs have that ragtime and Dixieland feel to them. I thought it would be cool to have a little bit of a horn section to see what it would sound like. What made you want to cover the Merle Haggard tune “Footlights”? That song was cut originally for the tribute record for Merle Haggard. I’ve always been partial to that song. It’s my favorite Merle song and it was my father’s favorite Merle song. The Crickets album and the tribute album were being made at the same time. I asked the label owner and he left me have it for my album. You have a new album in the works? It’s changed direction a couple of times. I want to do what I do best and where I connect best with me. Over the years, I’ve gotten countrier. Even “Yeah” is countrier. It’s really progressive for me but has some element of country with the lower timbre voice. Our mindset has been that we want to put out an album that’s congruent with the message. The message is traditional country. This is what I want to do moving forward. The next single will be traditional country. It must be great to have so much material to draw from for the set lists. It is. Hopefully, we’ll have another completely new set list in 15 or 20 years.